With Golden Jump Start for quicker, longer growth, Impact seed treatment to double your seedling survivability, and RainBond water absorbing polymers hold up to 200x their weight in water. Holds water that may be lost to percolation through the soil or evaporation. 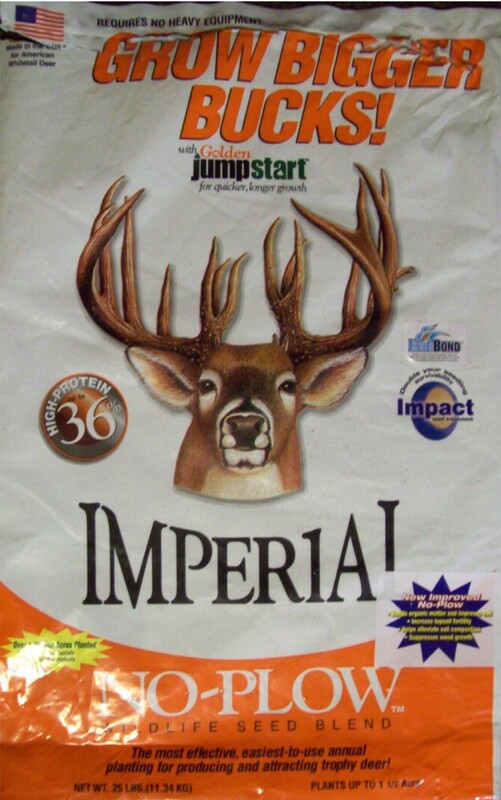 Increase topsoil fertility, helps alleviate soil compaction, and suppresses weed growth. 25 lb plants 1 to 1 1/2 acre at the rate of approximately 18 lbs per acre. 1. Seeds must make contact with the soil. 2. Do not plant in high weeds or grasses or where no sunlight can penetrate. No-Plow needs a minimum of 3-4 hours of broken, filtered, or direct sunlight a day. Old logging roads, fire lanes, small clearings in the woods, fence lines, power lines, and gas lines are ideal choices. Do not plant in HOT- DRY weather. 3. Cut grass and/or weeds as low as possible, or spray existing vegetation with an herbicide (i.e., Roundup) to rid the area of weeds and grasses. Follow the herbicide label directions and wait the required number of days before seeding. Clear debris to expose soil. 4. If possible, rough up the area with a rake or other tool. 5. Use 75-100 lbs of fertilizer per 10,000 square feet (100ft x 100ft) or 300-400 lbs of fertilizer per acre. 13-13-13 fertilizer or equivalent is good. 1. Soil test for a white clover. 3. Disk or till the ground and level with a drag or roller. 4. Spread seed at approximately 4-6 pounds per 10,000 square feet, or 16 – 25 pounds per acre. 5. New growth should begin within seven days after significant rainfall.